Urdha-moorthu is a traditional and religious ceremony performed by the bride and groom in their respective homes. The bride seats herself next to a stone grinder and with the help of other unmarried sisters and cousins grinds the 'urad dal' (type of lentil) and 'moong dal' (type of lentil) on the round stone grinder. The groom and his family are invited to this function. The groom does the same in his house and invites the bride and her family to the function. 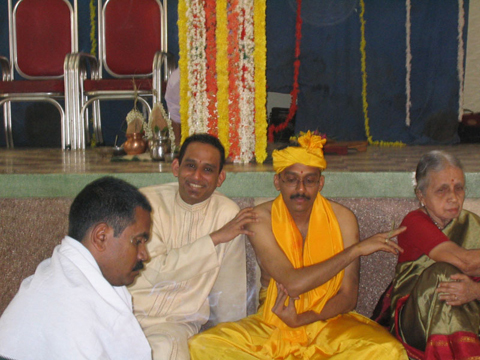 The family priest performs the puja of the nine planets or the 'navagraha puja' after the 'urdha-moorthu'. 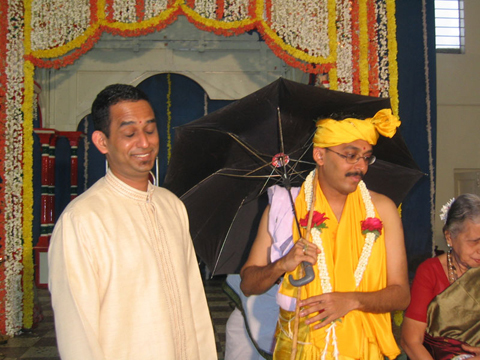 After the puja, the groom dresses himself like a pilgrim, wearing a 'veshti' (dhoti), 'chappals' (slippers) holds an umbrella and makes preparations to embark on a 'mock' pilgrimage and remain celibate for life! At this point the bride's father pleads with him not to go on the pilgrimage and asks him instead to accept his daughter's hand in marriage! After much cajoling the 'pilgrim' accepts and returns to get married! My brother finds this funny. Well, He's next!!!! Did I just poke my brother in the eye with my umbrella? Every Hindu is expected to cleanse and purify his body and soul through certain rights called Samskaras . These play and important role in man's life. The Hindu marriage is one of those sacraments. It is a pledged union of a man and a woman with the intent to follow the path of righteousness. The Hindu marriage ceremony or Vivaha is based on and adopted from the Rig Veda, one of the most ancient religions and philosophical scriptures and is considered to be very sacred. Though the Vedas are over 5000 years old, the truth contained in them is ever fresh and valid. This is a simple but important ritual consisting of a 'puja' (prayer) and is performed ten days prior to the actual wedding ceremony. The 'puja' is performed separately in both homes. The purpose being to negate the ill effects of any deaths in the family so that the marriage ceremonies may carry on without any obstacles. Mehndi is the traditional art of adorning the hands and feet with a paste made from the finely ground leaves of the henna plant. The term refers to the powder and paste, and the design on the skin, as well as the party or ceremony. Henna is a small shrub called hawsonia inermis, and is also know as Henne, Al-Khanna, Al-henna, Jamaica Mignonette, Mendee, Egyptian Privet, and Smooth Lawsonia. Henna grows in hot climates and is found in India, Pakistan, Malaysia, Persia, Syria, Egypt, Morocco, Sudan and other North African, Asian and Middle Eastern countries. The leaves, flowers, and twigs are ground into a fine powder, then mixed with hot water. Various shades are obtainable by mixing with the leaves of other plants, such as indigo. Tea, coffee, cloves, tamarind, lemon, sugar, and various oils are also used to enhance the colour and longevity of design. The father of the bride receives the groom at the entrance of the 'pandol' and the bride's mother performs the traditional 'aarti' for him. 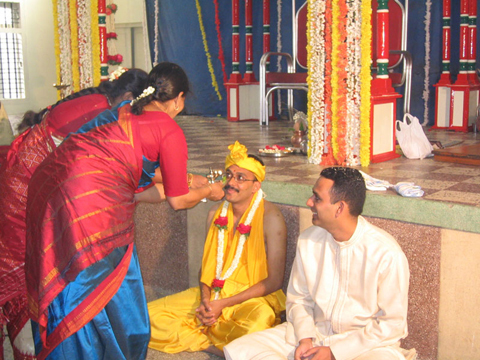 The groom is then seated and the bride's father washes his feet and ties the sacred thread or 'jhanava' on him. The bride is received by the groom's mother, who adorns her hair with flowers, performs an 'aarti' for her and showers her with rice. The showering of rice is known as the 'sesha'. She the invites the other married ladies or 'sumangalis' to come and bless her future daughter-in-law. The maternal uncle of the bride brings the bride to the mantap by holding her hand. Malasamparana - exhanging of garlands. The bride and the groom are made to stand of small heaps of rice grains, the boy facing east and the girl facing west. A cloth is held separating both of them. 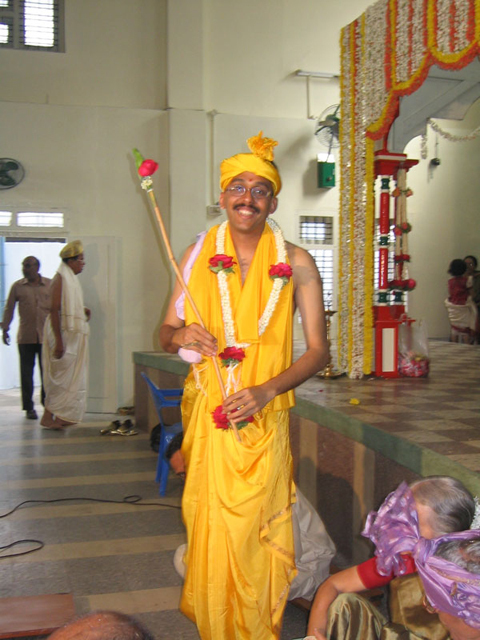 The priest then recites the sacred mantras invoking the ancestors of both the families. The bride and the groom proclaim their love and acceptance of each other by bestowing a garland on one another. This is the first step in their unity and the exchange symbolises the unification of their hearts. They sprinkle rice grains on one another. In this ceremony, the bride is given away in marriage. The bride's parents give their daughter as a diving offering to the groom to fullfill the obligations that are social, ethical and moral. The bride's parents offer prayers to their Gurus and elders and seek their blessings. Agni Prathistra The blessing of the God of Fire, Agni are invoked among Hindus. All solemn tites are incomplete without the performance of the Homa . An atmosphere of purity and spirutuality is created by the burning of the fragrant herbs and ghee to the tune of mantras. Fire is considered to be the most sacred because it is the giver of both Light and Energy. 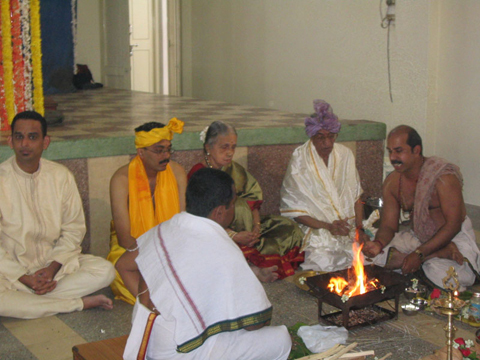 Panigrahana and Saptapadi are the fire rituals.